If you accidentally delete a file or folder in OneDrive, you may be able to recover it later from the OneDrive recycle bin. If you need to restore a SharePoint file or folder, see how to restore items from the SharePoint recycle bin. Tip: As an Office 365 Business subscriber, you can even restore your entire OneDrive if something goes wrong. Go to the OneDrive website, and sign in with either your Microsoft account or your work or school account. Select the files or folders you want to restore by pointing to each item and clicking the circle check box that appears, and then click Restore. Tip: If you're using OneDrive with your personal account, you can select Restore all items to restore everything in your recycle bin. This option isn't available in your work or school OneDrive. If you're signed into OneDrive with a Microsoft account, items in the recycle bin are automatically deleted 30 days after they're put there. If your recycle bin is full, the oldest items will be automatically deleted after three days. If you're signed in with a work or school account, items in the recycle bin are automatically deleted after 93 days, unless the administrator has changed the setting. See more information about how long deleted items are kept for work or school accounts. If you deleted the files or folders from your OneDrive desktop app, check your Recycle Bin (Windows) or Trash (Mac) to see if your files are there. 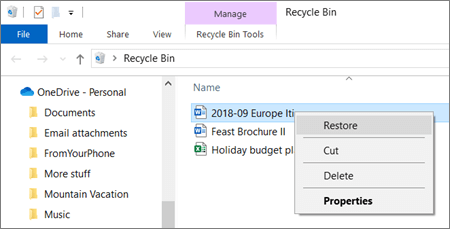 To restore files from your Recycle Bin in Windows, open the Recycle Bin, select the files or folders you want to recover, then right-click them and select Restore. The file or folder will be restored to its original folder. To restore files from your Trash on a Mac, open the Trash, select the files or folders you want to recover, then right-click them and select Put back. The file or folder will be restored to its original folder.